In order to achieve maximum flavor in your sauce without simmering it all day long, the first step is key! It is common in Asian food dishes so I thought I would try it with Italian, awesome results! Heat olive oil in a pan and add garlic, oregano, fennel seeds until it becomes very aromatic. Then add the paste and mix well with a fork. Add the sauce/crushed tomatoes and bring to a simmer. Add the veggies and basil and let simmer until you are ready to stack the lasagna. Blend all ingredients in food process or blender until smooth. 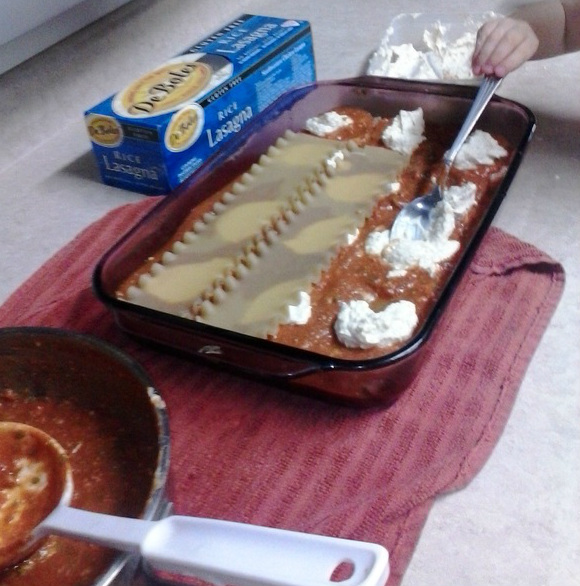 Layer the Lasagna in lasagna pan with a coating of sauce on the bottom, followed by noodles, sauce, and Tofu Ricotta until noodles are all used. The top layer should have dollops of Tofu Ricotta and then the remaining pack of Daiya cheese. I like to sprinkle some more House Blend on top. Bake at 350 for an hour or until noodles become tender.